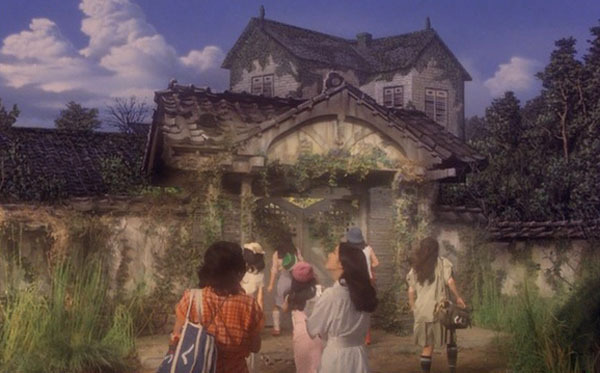 It’s difficult to approach Nobuhiko Obayashi’s 1977 Japanese film House (or Hausu) as simply a horror movie. To do so glances over almost everything that has made it a cult hit since it was first released in America in 2009. House is an unconventional film by any standard. On the back of their DVD release of the film, The Criterion Collection wonderfully describes the film as an episode of Scooby-Doo as directed by Italian arthouse-slasher director Mario Bava. It’s a good indicator of what you’re going to get. At times, House seems as if it is multiple, completely different films bleeding into one another: It is a gory haunted house film where teenage girls are murdered one by one, but it is also a goofy slapstick comedy with pratfalls and wacky side-characters. Not only that, it’s also a Japanese slice-of-life film with an unusual but understandable allegory for adulthood. It can also act as a commentary on the state of horror films in the 1970s. Most of all, House is a deeply weird film that demands your attention throughout its entire run-time. You can’t look away when a movie that was lit like a cereal commercial for the first 45 minutes suddenly turns into a bloodbath. The film is an off-the-wall visual tour-de-force that uses every single cinematographic trick in the book. Nobuhiko Obayashi and screenwriter Chiho Katsura based much of House off of discussions with Obayashi’s pre-teen daughter Chigumi. The duo had been tasked with making a horror film that would appeal to Japanese teenagers that would become a summer blockbuster on the scale of Jaws. The script is full of Chigumi’s suggestions: real things that scared real children, woven into a horror film that featured all of the tricks her father learned from directing commercials. Obayashi came from the world of Japanese commercials, and it certainly shows in the first third of House, with offbeat transitions and chipper music in scenes that introduce us to our seven main characters – all conveniently named after their defining personality trait (Sweet, Prof, Melody, Kung-Fu, Fantasy, Mac, Gorgeous; You can guess the tropes they are meant to represent). The gang’s leader, a girl named Gorgeous, is disaffected by her film composer father’s impending marriage to a younger woman. Annoyed by this marriage resulting in the cancellation of their summer vacation, Gorgeous plans a new one with her friends, inviting the group to stay with a seldom-seen aunt in the Japanese countryside. To tell any readers who haven’t seen the film themselves anymore is to spoil the manic and delightfully odd storyline that is to follow. Spoilers Below. Following their arrival, the girls begin to drop off: Mac disappears down a well and returns as a floating disembodied head, Melody is eaten by a piano she is compelled to play and Kung-Fu is swallowed whole by a ceiling light mid-kick. Meanwhile, Gorgeous becomes possessed by the house, revealing that her aunt died many years ago, and her spirit now consumes young virgins who enter. Admittedly, this plot synopsis leaves out most of the surrealist whirligig that is in this movie. There is certainly no other horror movie like it. For example, there are parts of the film that seem like they are from a completely different movie, particularly those involving the girls’ teacher Mr. Togo. There’s an extended scene straight out of Benny Hill where Mr. Togo trips over Gorgeous’ cat Blanche and falls end over end on the stairs, onto a bucket and keeps falling as he spills into the street and out into traffic. Remember: This is in a horror movie. Mr. Togo’s entire character plays with your perception of both comic relief and the traditional male hero of horror films of this type. The girls had invited him along to the house, and he promised to catch up with them later. They wait the whole movie for him to show up and he finally makes it to the house’s neck of the woods near the very end. Just when you think he’s about to save the girls and be the hero of this movie…he stumbles upon a watermelon vendor that the girls had encountered earlier. Mr Togo insults the seller so badly with his love of bananas, that he turns into a cartoon skeleton. The next time we see Mr. Togo’s buggy, he has been turned into a pile of bananas. Only in House. The special effects are unconventional and eye-catching and use animation and forced perspective to enhance its surrealist effect. In one scene, the remaining girls are cornered in a room and confronted by Gorgeous’ giant disembodied head. In another, Blanche – really another of the house’s spirits – turns from a cute fluffy kitty into a giant caricature of an evil witches’ cat which spits enough blood to flood the entire house. A few parts of House feel like call-backs to old Hammer Horror films of the 1960s, and the scene where Gorgeous details her aunt’s past is reminiscent of an old Japanese silent film, complete with intertitles. It’s debatable if House works as a “scary” horror movie. It’s certainly not comparable to Nightmare on Elm Street, or even Western horror comedies like Evil Dead II. But frights are not the main attraction to this movie as House revels in manic glee and pure cinema.